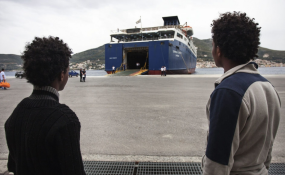 Two young Eritreans wait to board a ferry at Samos Island, Greece. Growing numbers of Eritreans are seeking asylum in Europe. Bahabolom must be one of the luckiest men alive. Now in Switzerland, granted refugee status, and studying French and German, his extraordinary journey nearly cost him his life. "I was like a football - kicked from one country to another," he told me from Zurich, which is now his home. Bahabolom - or "Bob" as he's known - set off from Eritrea (probably Africa's most repressive state) back in 2009. Via Sudan and Egypt, he crossed the Sinai before entering Israel. "I got a job as a dishwasher and then a cook, in Tel Aviv," he told me. "But I couldn't get asylum - I was only given a conditional release and had to report to the authorities every three months." In 2013 this changed. He was told to choose between three years in prison, being returned to Eritrea or deportation to Rwanda. Faced with this dilemma he chose Rwanda and - armed with Israeli travel documents and US$3,500 - he flew to Kigali. "We arrived at two in the morning. At the airport we were met by a man who called himself 'John'. He was a black man - I think he was a Rwandan official." He was taken to a house, where his Israeli travel documents were taken from him. "I protested," says Bahabolom, "but John didn't care. We had been promised by the Israelis we could live and work, but it didn't happen." The following day a smuggler arrived and offered them the chance of going to Uganda. With few options, Bahabolom took it. "It was a hard journey: we crossed the border illegally, on foot." But once in Kampala his situation was no better. Registration as a refugee was impossible, he couldn't work and finally he decided to move on again. Armed with a large sum of money, Bahabolom managed to get a flight to Turkey and from there crossed into Greece in 2015. "It was very difficult. We suffered a lot," he explained. Finally, in September that year he made it to Switzerland and safety. Bahabolom's story is by no means unique. If the Israeli authorities have their way it is about to be replicated by thousands of Eritreans and Sudanese refugees, most of whom live in Tel Aviv. According to the UN refugee agency these asylum-seekers and refugees now face the grim choice of relocation to countries in Africa such as Rwanda, or imprisonment in Israel. The plan is the latest iteration of a programme designed to expel the vast majority of Africans seeking asylum in Israel. The Israelis refuse to consider them refugees - instead terming them "infiltrators". Rwanda will reportedly be paid $5,000 per refugee. The policy was initiated in December 2013 and by June 2017, some 4,000 Eritrean and Sudanese had been pressed to agree to be "voluntarily" relocated to Rwanda and Uganda. The UN is at its wits end trying to deal with this crisis. "This is not burden sharing," Sharon Harel of the UNHCR told me. "It is burden shifting. These people are treated as refugees in orbit." Much of Israeli decision-making takes place behind closed doors. Refugee agencies complain that they have no access to the evidence that has been placed before the courts who have endorsed the government's actions. The UNHCR complains of the "secrecy surrounding this policy and the lack of transparency concerning its implementation" which has made it difficult to monitor what happens to the refugees when they are deported to Africa. Gilad Liberman, an Israeli human rights activist who has traced what happened when they landed in Rwanda, says that almost all the refugees are only allowed to remain in the country for a day or two. "They are then smuggled out of the country to Uganda. None are given visas to remain," he says. This was confirmed to me by the UNHCR, which has only recorded seven refugees, who arrived from Israel, who were given an official status by Rwanda and even they only received temporary visas, which soon expired. The plight of the refugees deported by Israel to Africa is well documented. A report by the Hotline for Refugees and Asylum Seekers - one of the Israeli NGOs active in this area - traced the men and women who had been sent to Rwanda. The refugees the NGO interviewed accused the Israeli officials of making false promises to them. In reality their travel documents were confiscated and they were held captive in the Rwandan capital, Kigali, until they could be smuggled into Uganda. This is the experience that has been reported by a Ugandan-based agency, Africa Monitors. They found that many of the traffickers are Eritreans themselves - an allegation supported by other researchers. A pattern is emerging of a complex network of trafficking that can finally be traced back to the Eritrean government itself, which uses its countrymen and women as a means of extracting funds in return for their onward journey to Europe and beyond. If the position of Eritreans in Israel is precarious, their status in the US is currently little better. While many are granted asylum, some are not. Those who are denied asylum have instead been released to sponsors, awaiting "final removal" back to Eritrea. In the past, the Eritrean government has routinely refused to grant them travel documents to allow them to be deported. John Stauffer, president of The America Team for Displaced Eritreans, which works with the refugees, told me this changed in September. "Under pressure from the Trump administration, the State Department has now refused to issue visas to Eritreans in Eritrea for travel to the USA as a means to pressure the regime to accept deportees from the USA. The US embassy in Asmara would not issue them." As a result, it seems, the Eritrean authorities have buckled, and Eritreans who were not granted asylum are being issued with documents that will allow them to be returned to Asmara. Asylum seekers are being ordered to report to immigration officers in the US and some are then re-detained. Desperate not to be sent back to imprisonment or torture in the country from which they fled, some are travelling north. "They are using the backroads to cross into Canada," says Stauffer. For Eritreans who have already endured complex journeys, travelled thousands of miles and crossed so many borders, it's a crushing experience. Paulos's brother, Tesfa (not their real names) is in detention, awaiting imminent deportation based on travel documents that the Eritrean government has now provided to US authorities. He told me he is deeply fearful for what lies in store and disillusioned with America. "The USA was for us always a country of refuge. People looked to the USA for moral leadership. Now my brother is facing deportation and torture. Who is there to look up to?" asks Paulos.